I saw this recipe on "Down Home with the Nealy's" cooking show on the Food Network channel. It looks easy and delish! Wisk wet and dry ingredients together. 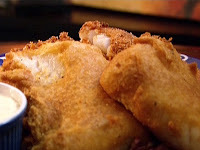 Dredge Cod Filets in the beer batter, allow to drip before dropping into the hot oil. Fry in oil 6-8 minutes, until golden. Drain on paper towels and serve.